Many marketing teams tremble when contemplating video production. They are intimidated by the medium and sometimes mistakenly think of it as a high-cost endeavor with low ROI. 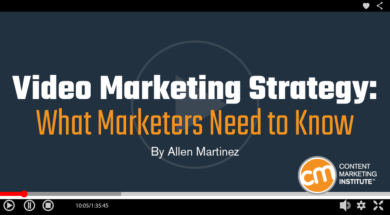 But video is a necessary component in most content marketing strategies. By 2021, 82% of consumer internet traffic will be video, according to a recent Cisco study. Too many marketers drive up costs and diminish video’s overall value by falling into the trap of creating multiple one-off videos. Other marketers mistakenly believe if they put big dollars into a video project, it will be a big success. An overarching strategy to guide video development is necessary to ensure that each video is simply a piece of the larger whole. Key performance indicators should be identified in the strategy. KPIs also should be identified for each video to ensure that it connects to the strategy and serves its purpose, which often relates to the target audience’s stage in the process. Has your organization used video? Why or why not? Results? What’s the purpose of the video strategy? Brand engagement, direct response? Something else? Multiple purposes? How can video help explain and assist with audience pain points? What is the short-term goal(s) of your video or video series? What is the long-term goal(s) of your video marketing strategy? How will you ensure message consistency within all videos, other marketing collateral, and your overall brand voice? What mediums do you want to optimize for? Getting executive sign-off on video marketing can be challenging, but it can be done. Make the case that video is an essential medium for your marketing toolkit and needs to have its own line in the budget just like Facebook ads, magazine ads, direct mail efforts, and all the rest. Detail the broad range of use for video – to build brand awareness, to show corporate responsibility, to promote, to entertain, to educate, etc. Video content was expected to consume 74% of online traffic in 2017 (KPBC). Visual content is 40 times more likely to be shared via social networks. (Buffer, 2014). 43% of consumers would like to see more video content from marketers (HubSpot). Marketers using video saw revenue grow 49% faster than those who were not (Aberdeen, 2015). 51.9% of marketing professionals in the world rate video as the content with the best ROI (Adobe, 2015). It’s also important to sell the execs on your vision by sharing the goals – how much will it increase brand awareness, engagement, profitability, or product awareness? Demonstrate how video content dovetails with your current marketing. To drive your point home, highlight existing assets – white papers, articles, blog posts, etc. – that can be transformed into a “snackable” video series. Getting executives on board with video marketing is only part of the challenge. You still need to follow through, and that begins with planning and strategy. What should be involved? It’s vital to have two sets of KPIs – ones that apply to the video and those that apply to the overall video marketing strategy. If you don’t have in-house staff with the experience and skills necessary or who have access to the right equipment, then working with an agency is always the better decision. Nail the messaging in both your videos and your video marketing strategy. Consistency is key. You cannot afford to create a video with one message and contradict that message in another video. Consistent messaging also ensures that your videos align with your brand voice. Too many marketers want to believe the Dollar Shave Club myth that they can achieve massive success for just pennies on the dollar. Sadly, that’s not the case. You need a medium-sized budget that allows for quality production and high amplification. This is Allen Martinez speaking at SMX. You need to continually measure results, costs, and failures, and evolve your video strategy and implementation based on the lessons learned. Don’t look at the analytics through a single lens, such as the time of viewing, CTR, video placement, etc. Video is a multidimensional asset that acts as a mini-funnel on its own and should be measured accordingly. Video can be challenging and expensive. However, it is an ideal medium for expressing a dynamic message in a simple form and it far outstrips other media in terms of reach and performance. Don’t be afraid to test and learn with video but make certain you’re building the best team as you do. Video is on the agenda for Content Marketing World Sept. 4-7 in Cleveland, Ohio. Will you be on the scene? Save with early-bird registration (ending May 31) and use code BLOG100 to save another $100. Register today. Noble DigitalFounder, and award-winning Creative Director Allen Martinez has created successful content campaigns for some of the largest brands on the planet, including: Coca-Cola, In-Bev, Subway, Nestle, AT&T, Quest, Hilton Hotels, Burger King, Univision, Yamaha, Miller Lite, Proctor & Gamble, Heineken, Orbitz, Wrigley’s and has then used those same principals to help scale startups like: Telesign, Plated and Fundrise, BiohmHealth.